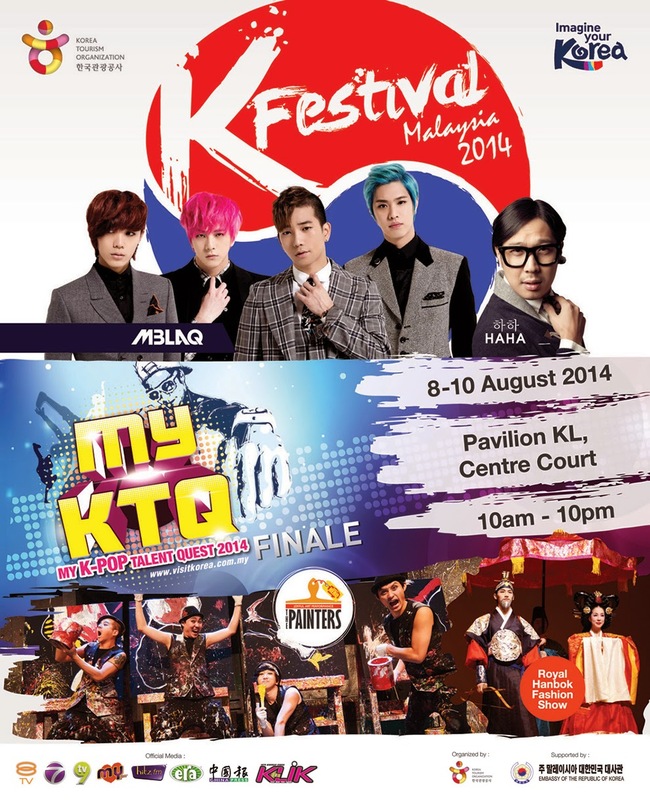 Fans of the ‘Hallyu Wave’ were in for a treat at last week’s K-Festival Malaysia 2014. The Korean festival was held at Pavilion Kuala Lumpur from 8 to 10 August 2014, kicked off on Friday onwards from 10AM to 10PM. K-Pop fans were especially thrilled with performances by special guest performers, HAHA and MBLAQ. Visitors had the chance to be better acquainted with the Korean culture through various booths set up including booths that promotes tour packages, Korean food, wedding photography and more.Noted performers for the day include Kayarang and Painters Hero. Kayarang is a performing duo formed by identical twins who play instrumental versions of classic as well as contemporary songs on the Korean musical instrument, gayageum. The twins impressed the Malaysian crowd when they did a rendition of Malaysia’s very own national anthem “Negaraku”. Painters Hero, meanwhile, is a group that does non-verbal performances, combining live painting with mime and dance moves. The four members did a good job wowing the crowd with their speed drawing and action painting, not to mention their slick dance moves. The highlight of the day was the fan meeting with Running Man member and K-reggae singer, HaHa. Throngs of fans crowded the shopping mall hours before his appearance was even due. The “Rosa” singer was greeted by loud screams and energetic applause by the time he appeared onstage. 200 lucky fans, chosen beforehand, got the chance to meet the Korean entertainer up close and receive his autograph. The lucky fans even managed to take pictures with him and give him hugs. Kayarang and Painters Hero performed again for the next two days. On Saturday, visitors were treated to a parade of beautiful Korean traditional clothes in the Korea Royal Hanbok Fashion Show. The event highlight for the day was the appearance of K-idol group, MBLAQ. Only four members were present, however, as Lee Joon was otherwise occupied back in their home country. Seungho, G.O., Mir and Thunder were still able to perform seamlessly despite the member shortage. The quartet performed three of their hit songs, “Be A Man”, “Mona Lisa” and “Oh Yeah”. Sunday was the final day of the festival. MY K-Pop Talent Show 2014 (MYKTQ) Finale was held on the same day, showcasing some of the best of what Malaysia has to offer. The festival ended with a final parade of Korea Royal Hanbok Fashion Show. KLOSEUP would like to specially thank Korea Tourism Organisation (KTO) for the invitation.